Managing partner Michael J. Bidart was recognized by the National Law Journal as a Plaintiff Trailblazer in its annual issue recognizing plaintiff attorneys who have made a significant impact over the course of their careers. This is the latest award for Mr. Bidart who has been honored by numerous legal publications and peer organizations throughout the country. Over his career. 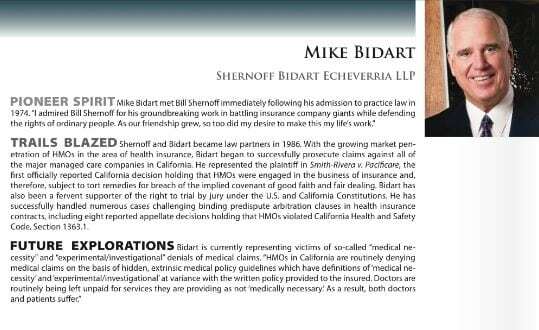 Mr. Bidart obtained the largest verdict against an HMO in history, helped shape the law through his numerous published appellate decisions and secured many other landmark decisions. Recently, he was victorious on a jury trial on behalf of a young woman who lost her leg due to Kaiser Permanente’s negligent care. The jury awarded the woman $28.2 million. He continues to fight on behalf of insurance consumers and help to shape the insurance industry to benefit insurance consumers.